Mickey and Minnie Mouse are on a tropical vacation in Hawaii! Minnie dances the hula while Mickey plays the ukulele, and Pluto plays in the surf in the background. Above the happy scene, a vibrant rainbow arches over the sea. This delightful image by Thomas Kinkade Studios is already sunny and sweet, but it's even more charming shaped like Mickey's instantly recognizable profile. 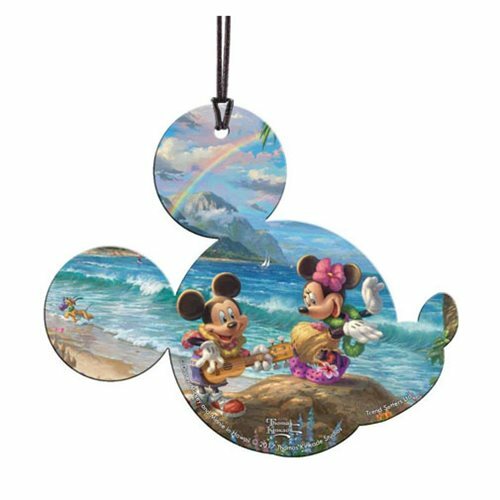 The Disney Mickey and Minnie in Hawaii Acrylic Print measures about 4-inches wide from ear to nose x 3 1/2-inches tall from chin to ear. Scratch resistant and light-catching, it looks terrific on any tree, wall, window, or even your car! Hanging string included.